A few years ago Pieminister started selling Gluten Free pies in their shops, but unfortunately I couldn't regularly get hold of them because there isn't a Pieminister shop near me. So I was delighted when they started selling them boxed in Sainsbury's. If I am to buy a pie from the supermarket this is my preferred choice, especially when they are on offer. It is great that there is now so much more choice in Gluten Free products including pies. It is fair to say that the standard of product has also gone up. I look back at some of the pies I reviewed a few years ago and to be honest, if I was to review some of those pies again I would probably score them lower. This Pieminister pie is probably the best you can get in a supermarket at the moment and it is well overdue a review on Pierate! Here are my thoughts on their Gluten Free Moo which is Steak & Ale Pie. I am told that this is based on one of the favourite flavours from their standard gluten containing range. Condition - 5.5/7 - The pie looked nice, it was tall and appealing. It had collapsed a little and perhaps could have benefited from a foil tray rather than being free standing. It was in a plastic tray in the box which I don't like but didn't affect the s.
Colour - 5.5/7 - A nice golden brown around the edges but a bit pale and greasy looking towards the middle but overall an attractive pie. 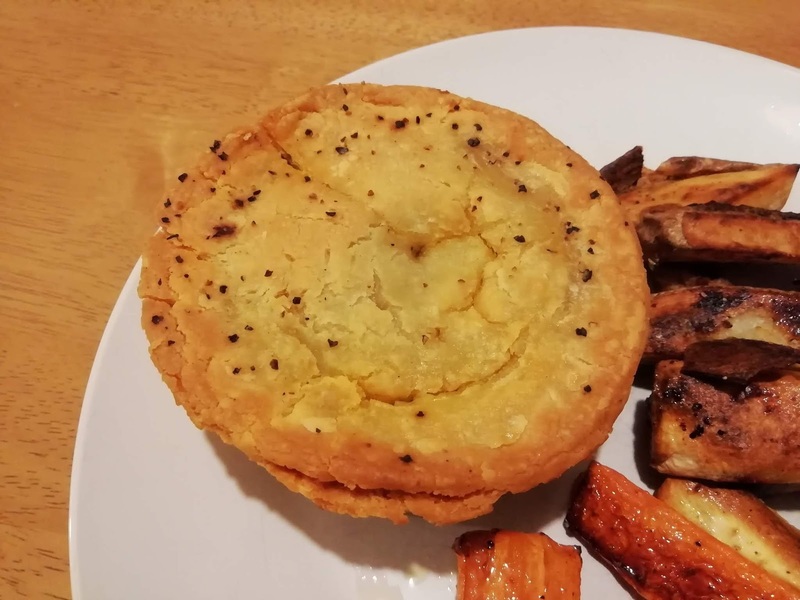 Capacity - 6.0/7 - The pie scored strongly because it was tall, especially compared to other Gluten Free pies out there which tend to be shallow. It had a marginal sag in the middle. It was well filled with content without much air gap. Cheapness - 5.0/7 - At £4.50 standard price this is really not a cheap pie. But it is important to remember that it is premium product. You can buy a box of two Genuis pies for around the same price but they are about half the size and have hardly any filling. I would rather spend my money on this pie and eat it less often. 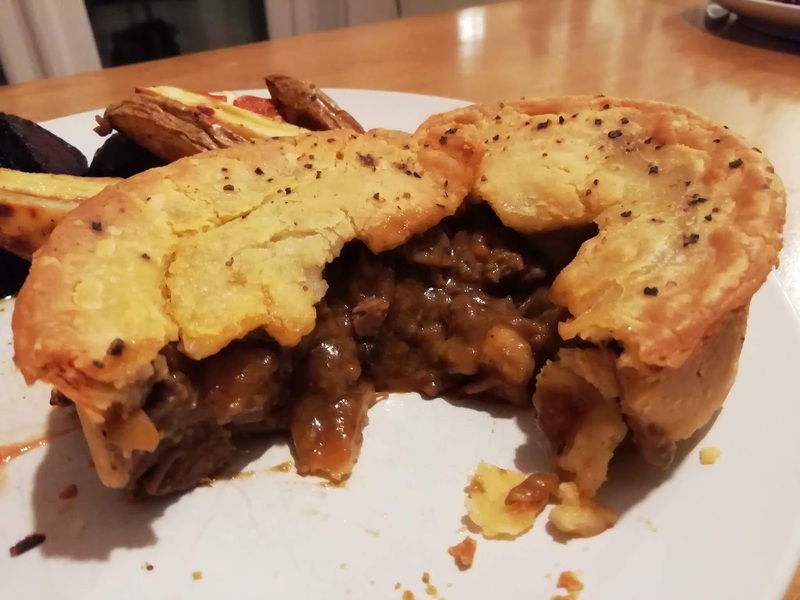 Content - 5.0/7 - The filling was a classic beef pie flavour and was very tasty although not out of this world. The chunks of meat were in a thick sauce and accompanied by pieces of carrot. The meat was tasty but in quite small pieces, I think for the price I expected bigger chunks. The smaller chunks probably made it seem like there was more meat than there was. The pastry also tasted really nice. Chewiness - 6.0/7 - The meat was nice and lean and I didn't find any chewy bits. There was a brilliant crunch to the outside of the pastry. Consistency - 6.5/7 - This pie is a great pastry and filling combination and works really well. The thick sauce has a satisfying consistency. Overall a great product which is illustrated by the fact that I keep buying them! I would probably buy them more but I am trying to avoid buying any products packaged in plastic!